Kellogg Community College’s new commercial promoting registration for the Spring 2019 semester is live now online and on television. 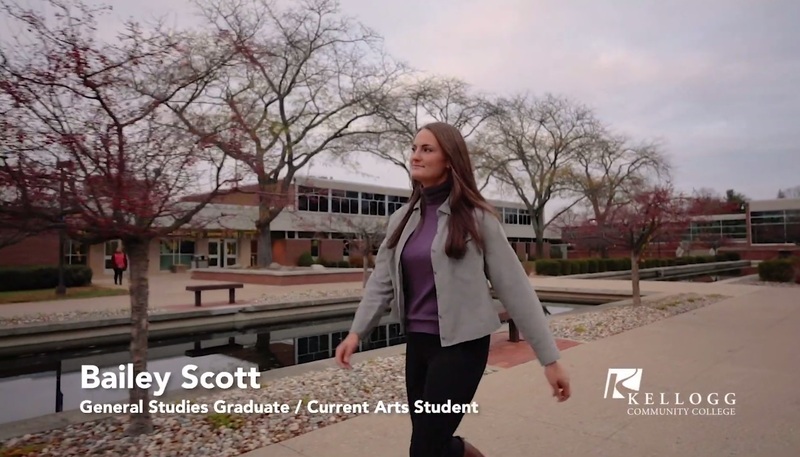 The commercial continues KCC’s popular KCC Stories campaign featuring current and former KCC students, with this one focused on KCC Marketing Intern Bailey Scott. Click here to view KCC Daily posts written by Scott over the past year. In addition to her studies and work at KCC, Scott is a professional photographer and an avid outdoorswoman sponsored by AMS Bowfishing and Evoke Kayaks on Instagram. See her Bails Photography Facebook page at www.facebook.com/BailsPhotography115 and her bowfishing Instagram feed at www.instagram.com/bowfishing_bailey. Keep an eye out to see the commercial live on TV, view it embedded below or check it out on YouTube at www.youtube.com/watch?v=nMPzNs9Id90. My name is Bailey, and my decision to attend Kellogg Community College was easy. I started as a dual-enrolled high school student, which allowed me to get ahead and save money for the future. Outside of class, I’m a marketing intern at KCC, I’m active in the running club and I have a passion for the outdoors. Soon I’ll graduate with two associate degrees. For me, Kellogg Community College is about getting the opportunities that help me build a better future. Classes start Jan. 11. Register today at kellogg.edu/registration. As noted in the video, the first classes of KCC’s Spring 2019 semester begin Jan. 11. For more information about signing up for spring classes, click the link above to visit KCC’s Spring 2019 Registration page.